My recent comic book store subscription haul can attest to the Iron Man 2 mania that has been building over the last few months. Three separate Iron Man titles were within it, and that isn't even counting The Invincible Iron Man, which is in the running for Marvel's flagship title. How amazing is it that Iron Man and Green Lantern are now the marquee characters for Marvel and DC? A few years ago, they were both in the slumps, until Matt Fraction and Geoff Johns reinvigorated them with powerful new titles and concepts. Invincible Iron Man even won an Eisner for "Best New Series." I reviewed the first hardcover, The Five Nightmares, a while ago, and I've decided to lump the next two, World's Most Wanted Book 1 and Book 2, into one review, in part to help me through my Iron Man trade backlog. Book 1 picks up not quite where The Five Nightmares left off. The Secret Invasion event takes place in the middle and affects the character in a major way, driving the entire "World's Most Wanted" arc. Thankfully, the collection includes a recap page to explain broadly what occurred, and most of the details are brought out throughout the story. Essentially, the Skrulls, an evil shape-shifting race, crippled Iron Man and ruined all of his technology during their invasion. Norman Osborn was able to kill the Skrull leader and gain the trust of the public, rising to lead HAMMER, the replacement for SHIELD. Putting aside my own personal feelings about Dark Reign (it's an interesting concept, but how stupid are the people in the Marvel universe to go along with all of this? ), it all sets the stage for a year-long story. Osborn wants the Superhero Registration Act database, the cause of the Civil War event. Unfortunately, only one copy exists . . . and it's in Tony's head. What follows is an extensive chase scene, as Tony starts to lose his memories, skills and intelligence after he mindwipes himself to erase the database. This is padded out a lot in Book One, especially with a confrontation between ally Maria Hill and the Controller that doesn't seem to go anywhere. Other elements make up for some of the slow pace, including meet-ups with War Machine and Namor, and Iron Man's longtime assistant Pepper Potts becoming a superhero. This is actually a good turn for a character that sometimes gets pushed to the side by other, more action-oriented characters like Maria Hill. Potts' entire cause is encompassed by her name: Rescue. She's aided by an element that migrated from the Iron Man films: the JARVIS AI system. All of this ends with a fantastic set-up for the second half of the series, and Book 2 does not disappoint. Even more of Tony's allies and enemies arrive, including as Madame Masque, the Crimson Dynamo and the Black Widow. After going through a variety of armors in decreasing levels of complexity, Tony finally makes it back to where it all began: the cave in which his first armor was built. If there was any question that Invincible Iron Man is dedicated to incorporating the movie's style into the comics, then there is one line in this segment that will destroy all doubts. Like many things, it's too good to spoil, but all I can say is that it ties into a popular Internet meme. At the end, there's the long-awaited face-off between Tony, wielding the first armor, and Osborn, clad in the ultra-modern Iron Patriot suite. You might expect that this isn't a fair fight, and you'd be right . . . but that's the point. Surprising, Tony is left in the end comatose . . . and ready for the next part of the story. Fraction and Salvador Larroca keep up the quality of The Five Nightmares and skillfully combine action with intrigue. At times, there tends to be a little too much navel-gazing on Tony's part . . . but then, that's a flaw that nearly every Iron Man story since the 1980s possesses, so I really can't hold that against them. War Machine's appearance is especially well-done, although if you didn't know that Rhodey was a cyborg for some time, you might be shocked at his appearance. Salvador Larroca continues to produce fantastic art, even if he veers into cheesecake every now and then with the Black Widow. I also have to give him a special kudos for giving the Iron Patriot movie-style air brakes in one panel. If you enjoyed The Five Nightmares -- which is probably most readers -- then World's Most Wanted is a perfectly-suited follow-up. If you haven't bought The Five Nightmares yet, then you can get the contents of all three hardcovers in one Omnibus edition for a surprisingly low price. Right now, Invincible Iron Man is the best Marvel has to offer, and combined with the second Iron Man film, it's a very good time to be a fan of Ol' Shellhead. Can't say I was all that thrilled with this particular storyline (I have the omnibus). 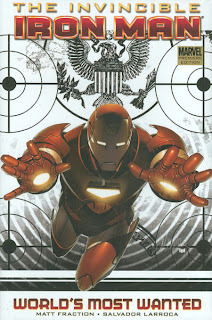 I very much preferred the earlier Iron Man stories by Warren Ellis (Extremis) and the Knaufs (Iron Man: Director of Shield) from the prior Iron Man series (I think titled Invincible Iron Man or something). I have the trades, but I think you can pretty much read nearly every issue of the run with a Marvel Digital Comics subscription. Two things I didn't like - Tony Stark's pornstache look (as well as the art in general, but really, the pornstache look is just ridiculuous), and the somewhat simplistic and decompressed storytelling of Most Wanted (this story could easily have been half or even a quarter as many pages). You know what needs to be reviewed - the Daredevil Omnibuses - Bendis I and II; and the Brubaker (volume I is out, volume II is upcoming). If there is a great marvel series worthy of review over the past decade, it's the daredevil stuff by Bendis and Brubaker (plus Bru's Captain America, part of which has been reviewed here). It's rare you get two great runs in a row by different writers.